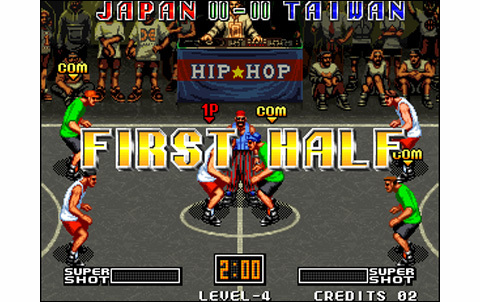 Data East is a company that experienced a few prolific seasons on the Neo Geo, and players didn't often had to complain about it... It must be said that the firm brought its stone to the building, with a radically different style, contrasting sharply with the SNK or ADK productions, well known on the machine. 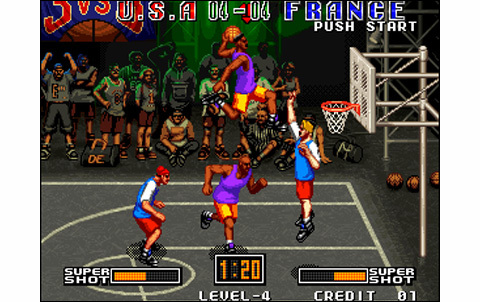 While basketball fans had a false joy in 1991 with the announcement of Dunk Star (Sammy), which was in fact never released, they had to wait until 1994 that finally to eventually see the first (and the last) basketball game on the Rolls Royce of video systems. So first of all let me say, if you like realistic sport simulations, I recommend you to go your way! 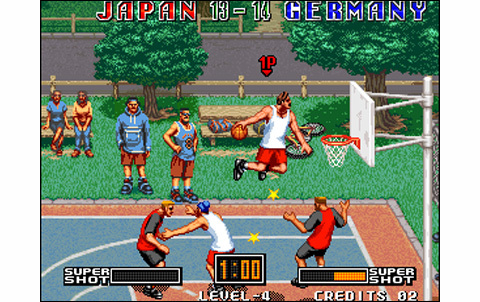 Here is some kind of street basketball, three against with three, with guys who can jump nine meters high, have the ability to fire the ball during a shot, or to hover weightlessly for dunks. What do you say? Science-fiction? 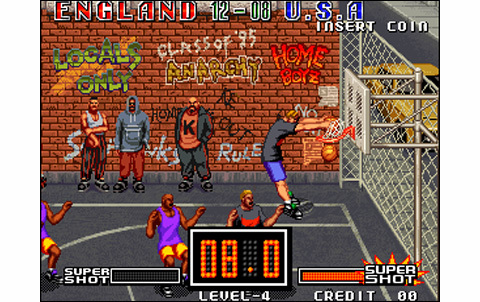 Okay, it's true that the style an realism level is clearly set on "arcade", but don't shoot down so fast our only neo-geo basketball game. 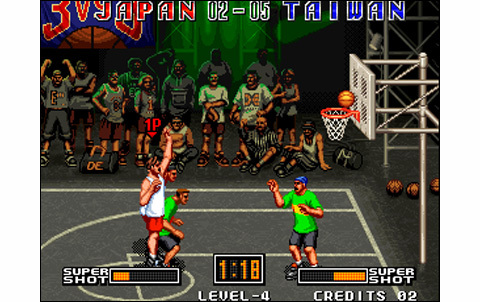 We've already seen much more exaggeration in various sports games on 16-bit systems before. Such as football players performing kamehamehas, talented golfers using telekinesis, or famous boxers doing a flaming dragon punch. 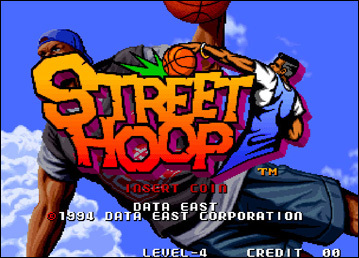 Street Hoop, if it modestly offers a "Super Shot" (read, a special move that is only available when the gauge is full), nonetheless opts for sobriety, with a beautiful array of tricks and feints, all requiring a quite accurate timing. 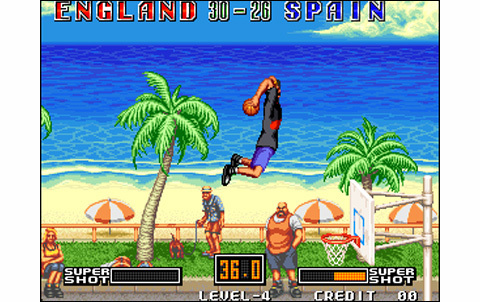 Indeed, all these can be countered at any time, even during a dunk. 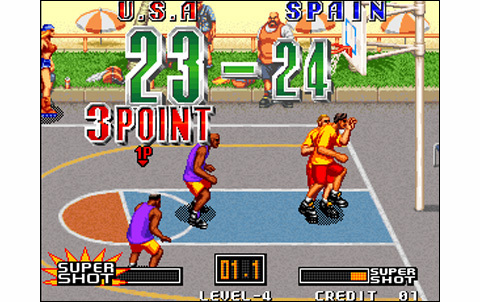 And let's mention that three-point baskets are rather difficult to score. Passes can also be intercepted, while a "steal" that can be made when you're near the opponent holding the ball. No headbutts, jumping kicks and other ura mawashi-geri in the face... sorry about that! 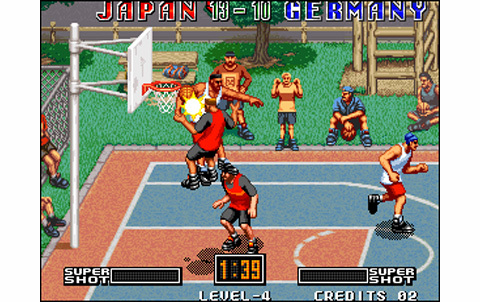 Street Hoop features ten different three players' teams, all with their strengths and weaknesses. 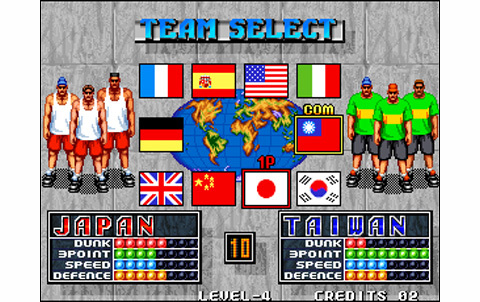 For example, americans are the kings of the dunk, taiwanese are experts in three-point baskets, the krauts have an iron defense, while the froggies or the japanese are the most balanced teams. 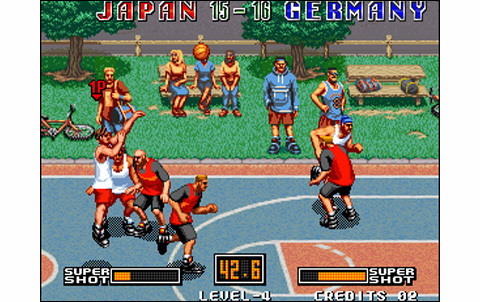 The matches take place in two half-times. 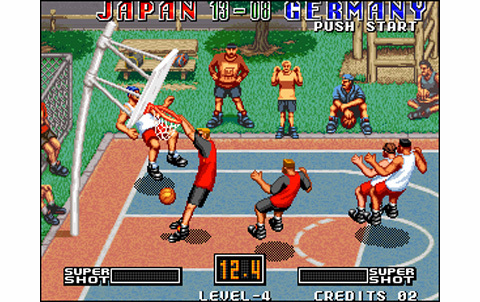 The action is pretty binary: when one team scores a basket or misses a shot, the rival team gets the ball and the other gets defensive to try to hinder a possible opponent basket. The best outcome is a ball interception, often for marking in a counter action and take the lead... this is why it's quite important to have a good defense! 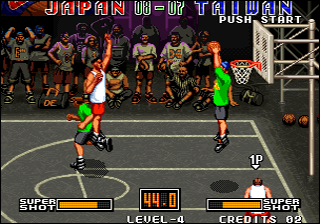 You can try to steal the ball with the B button when you're close to the holder. 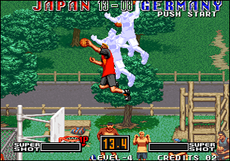 A allows to jump in front of an opponent trying to dunk. When attacking, you shoot with A, pass with B, while a multitude of tricks and combinations are possible, and some will be taught to you during the half-times. So try to stay focus during these short sequences! 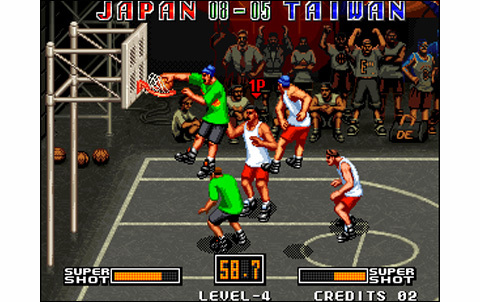 Street Hoop is very nice to watch and to listen: there are five different game areas and these are looking good. 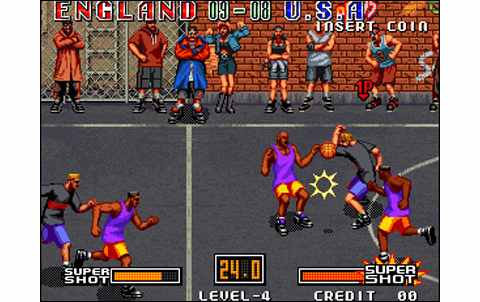 The character's animations are fluid, while the soundtrack plunges into the right mood with its New Yorker 80's gangsta rap and some sound effects of good quality. The players are simply but well drawn, while the whole have all the details that make the difference (shadows, visual effects, depth). 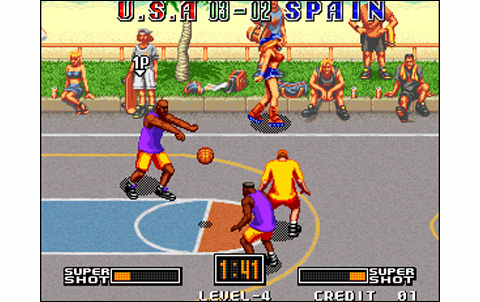 The fun in Street Hoop is present from beginning to the end, especially when two players are facing each other. To say the least, the single player game is a bit of a daunting challenge, but with some practice, you can quickly make it to the end. 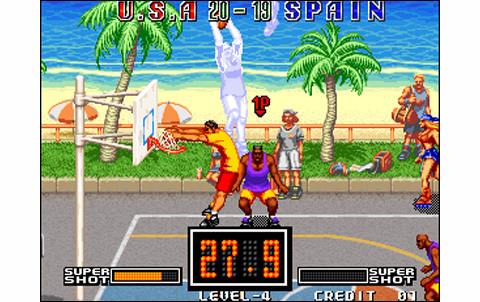 The games with friends, like in Windjammers, are funny and engaging. Only downside, the accuracy could have been better, for example when one wants to steal the ball, the contact window could have been a bit more "generous". 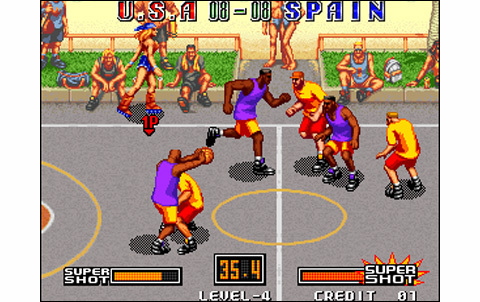 Nevertheless, after a few games, you get better and the game fun comes instantly, pushing you to play again and again. The game is colorful and the draw accurate, with a lot of funny details. But the sprites are not varied enough and basket courts too few (five only). 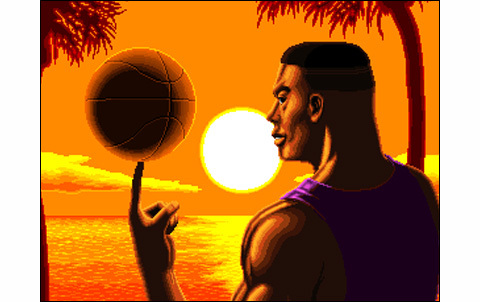 Smooth and fast enough, the animation was an important part for Street Hoop to be successful: mission completed! Rap music which are 100% of the game are catchy, we are even granted some good digit voices. The ball sounds are pretty nice. On your own, the difficulty can hold you for some time before you clear the game. Playing two, SH shows all its interest: the fun is tenfold! The game uses only two buttons, but the range of moves and techniques, offensive or defensive, is wide. 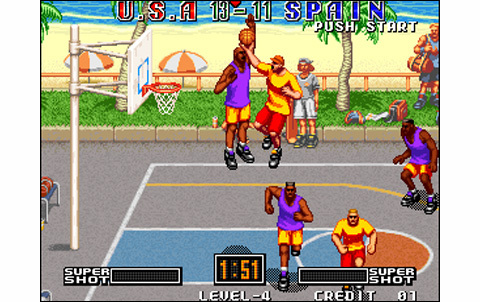 The rhythm is fast enough, well, it's esxactly what you expect from a real arcade game. 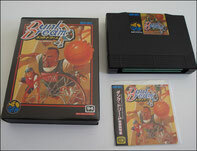 Data East signs the one and only basket-ball game for the Neo Geo... and of it's a little scanty for one player, it's an excellent soft for two players. With 300 euros going away to get AES' cheapest version, we can't talk anymore about a good value for money rate here. However, Street Hoop / Dunk Dream is still a pretty nice arcade basketball game and it's the only one on the system.